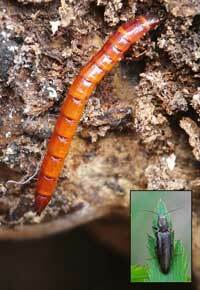 A click beetle overwinters as a larva under the bark of a rotting log. (Photos by Mary Holland) When you think of something as small as a one-tenth inch bark beetle surviving a winter with temperatures that dip well below zero for days on end, it seems miraculous. How does ice not form within its cells, causing it to die? It’s because that beetle and millions of other insects are capable of manipulating their metabolism and biochemistry to avoid freezing to death. But how do they accomplish this? All insects are ectothermic, or cold-blooded, and thus take on the temperature of the air around them. Cold weather slows them down, and during the winter they enter a resting stage called diapause, often referred to as hibernation. During diapause their metabolism slows down and normal activities cease. Many insects recognize that it’s time to begin preparation for diapause by the decreasing amount of daylight in the fall. In response, they start to migrate downward, where there’s more protection from the elements—migrating from trees, shrubs, and plants down to the leaf litter, rock crevices, and in or under rotting logs and under rocks. Even in these locations, however, more protection is usually necessary to avoid freezing. Two of the methods insects use to acquire additional protection include tolerating freezing (freeze tolerant) and relying on other mechanisms to avoid freezing (freeze avoidant). Carpenter ants in a log. 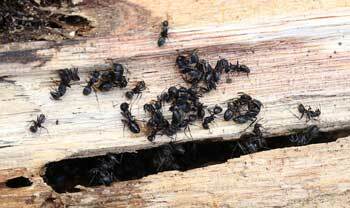 Carpenter ants cluster in their galleries during the winter and produce glycerol to prevent destructive ice crystals from forming in their bodies. Freeze-tolerant insects can withstand the formation of internal body ice, whereas freeze-avoidant insects avoid freezing by keeping their body fluids liquid. In New England, where there are long periods of cold temperatures, the main strategy of most insects is freeze avoidance. This can be achieved in several ways. One is to seek out a spot where ice usually doesn’t form, such as a very dry location. Another is to create some kind of physical barrier, such as a wax coating, that protects against ice forming on the external skeleton. Regardless of such strategies, all freeze-avoidant insects that can’t tolerate the formation of ice in their body fluids lower the temperature at which their body fluids freeze. A process known as “supercooling” allows water to cool below its freezing point without changing into a solid. Water needs a particle in order to crystallize, and with no such particle, it can cool down to minus 43 F. without freezing. Freeze-avoidant insects that engage in supercooling remove or inactivate all of the food particles, dust, and bacteria in their gut or inside their cells, so the fluid within their bodies can’t solidify in northern New England winter temperatures. In addition, some insects synthesize substances such as glycerol throughout their head, thorax, and abdomen. This substance acts as antifreeze, reducing the lethal freezing temperature of their bodies. This state of suspended animation, or diapause, often takes place in or just under the bark of a rotting log. The insects that seek winter shelter here often have the company of other ectothermic creatures, including spiders, snails, and slugs. For the next few months, however, there won’t be much fraternizing among them. Mary Holland is the author of “Naturally Curious: A Photographic Field Guide and Month-by-Month Journey Through the Fields, Woods, and Marshes of New England,” “Milkweed Visitors,” and “Ferdinand Fox’s First Summer.” She has a natural history blog which can be found at http://www.naturallycuriouswithmaryholland.wordpress.com .